Why are we excited about this? Well not everything that's brilliant at CES is hardware. vClone is a clever new tech from Iomega that basically clones your entire PC, saving it to an external hard drive. Bear with us. Then, you can take the drive wherever you want to – to work, for example. Plug the drive in and you can load up your entire PC in a window on your desktop. You don't just get access to your files, you can actually use your PC on another PC. Now that's cool. And what's more any changes you make are automatically synchronised. Get home, plug the drive in again to the original machine and your changes will update. 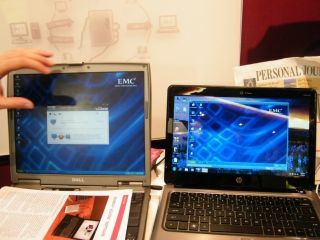 The tech uses VMware virtualisation technology from Iomega's parent company EMC. Of course, virtualisation isn't new. But it's hardly been a consumer offering up til now. The key boon with vClone is the ability to access protected digital media, so you could take your iTunes library to work, for example. You will need to install some software to run the clone machine though, but no other files are left behind on the secondary machine – it's all run off the drive. The software, which is available as a free download, is compatible with Iomega hard drives only (surprise!). vClone will also ship with Iomega USB 2.0 portable hard disk drives out of the box.